For a free, no-obligation quote, call 1-866-680-5139 or visit www.CalCas.com/CTA CA Lic#0041343 *Coverages described are subject to availability and eligibility. ©2014 California Casualty Rate cuts, With our new LOWER RATES and BIGGER DISCOUNTS on bundled Auto and Home Insurance policies, you can protect what's important to you for less. Take advantage of California Casualty's unique benefits, superior service and unprecedented savings – even if you've quoted with us before. 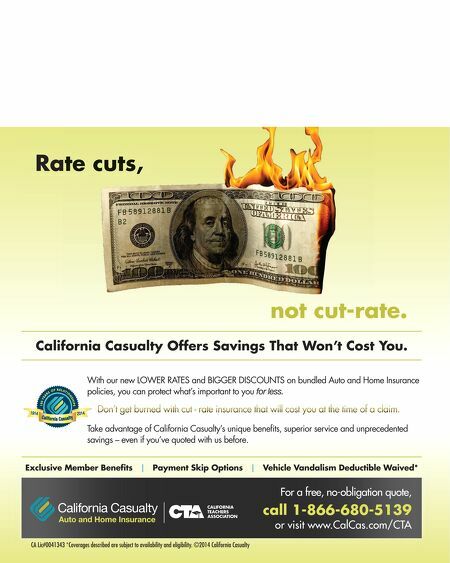 California Casualty Offers Savings That Won't Cost You. Exclusive Member Benefits | Payment Skip Options | Vehicle Vandalism Deductible Waived* Auto and Home Insurance not cut-rate. Rate cuts, Don't get burned with cut - rate insurance that will cost you at the time of a claim. Don't get burned with cut - rate insurance that will cost you at the time of a claim. Don't get burned with cut - rate insurance that will cost you at the time of a claim. Don't get burned with cut - rate insurance that will cost you at the time of a claim. Don't get burned with cut - rate insurance that will cost you at the time of a claim. Don't get burned with cut - rate insurance that will cost you at the time of a claim. Don't get burned with cut - rate insurance that will cost you at the time of a claim. Don't get burned with cut - rate insurance that will cost you at the time of a claim. Don't get burned with cut - rate insurance that will cost you at the time of a claim.